The Spin: Scorsese’s flashy pilot episode did not disappoint. So much happened and so many characters were introduced (and a few already met their demise) it almost functioned as its own mini-film…not surprisingly given the man behind the camera. 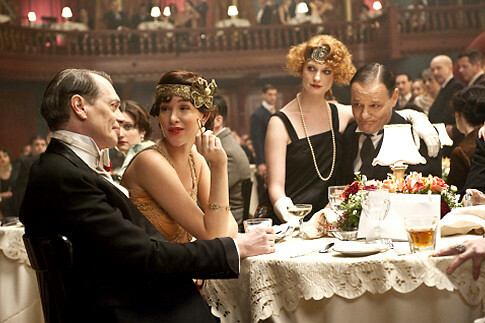 My Favorite Parts: All that period jazz music, the 1920’s version of an “insult comic”, the funny gathering of intel bit where Michael Shannon’s character tried relaying all the mobsters’ names to a hapless partner, and the ranting of Nucky’s sassy mob moll Lucy (Paz de la Huerta). Characters/Plots I Can’t Wait To See Develop: All of them, but especially the relationship between Nucky (Steve Buscemi) and Margaret (Kelly MacDonald). Also, it will be interesting to see just how far Michael Pitt’s Jimmy character will go to seize his opportunity. The Verdict Is Still Out On: The opening credits, which seemed anachronistically out-of-place with all the other sumptuous period detail and jazz music. Also, the insertion of characters like Al Capone and Lucky Luciano could become distracting. This entry was posted in Boardwalk Empire: Complete Episode Guide, Pop Culture, Television and tagged Atlantic City, Boardwalk Empire, Boardwalk Empire Blow by Blow Episode Guide, HBO, Kelly Macdonald, Martin Scorsese, Michael Pitt, Michael Shannon, Mobsters, Nelson Johnson, Paz de la Huerta, Prohibition, Season One: Episode One, Series Premiere, Steve Buscemi, Terence Winter, The 1920's, TV Series. Scorsese’s style was definitely evident with quite a few exquisite uses of the camera. I agree with you that this episode could stand alone as a short film. I actually like the blending of real life characters in with the fictional, makes you want to dig in and discover what is true and what parts are fictionalized. Winters stated before the show started that he did not want to be bound by actual incidents, one of the reasons he fictionalized Nucky’s full name. The sets are fantastic as well as the detail to period clothes and music. Please couldyou update the link, it says error, I am New to Boardwalk, I feel like it should come with a guide! I was curious about the babies, I was also. Confused about James the driver and James the husband, were they the same character, they just look too much alike. Who was killed at the end-at whose behest? I loved it. Some of my favorite parts were the funeral home liquor boss’s laugh, reminded me of Dr. Giggles. And I rather enjoyed the “Muppet Babies” of gangsterism with Capone and Luciano. I don’t see it being a distraction because I don’t think it’s going to be visited as much, at least until they both really take power and then I think it will be vital in the storytelling…….. I hope the other episodes can mantain this kind of direction, I hope the standard hasn’t now been set to high thanks to Scorcese. I enjoyed it immensely. The dialogue was quick and comfortable. The photography was also excellent. You also have to mention the music. What a treat it was to hear that 20’s music! My favorite scene: When Nucky walked down the boardwalk, I was in awe of how realistic it looked. My take on the “babies in the incubators” part, I interpreted it as something related to his wife. This show better be a hit, because I’m already hooked. Oh and Fatty Arbuckle burying a bottle-hilarious! 1920’s themed casino? Sign me up! Actually, wouldn’t it be nice if everyday fashion reverted back to this era? 3-piece suit and a fedora would hide my extra pudge. Don’t try to act like you wouldn’t rock a derby hat, sir! Now where did I park my blue Rolls Royce? Just finished watching the pilot less than an hour ago. I thought it was satisfyingly cinematic and very intriguing, although it felt too much like a typical HBO mini-series rather than an actual full-fledged series, mostly due to the amount of detail Scorsese included to bring out the atmosphere of the Roaring Twenties. The in media res opening reminded me a lot of Goodfellas, which is always a plus. I can’t say I’m disappointed, and I’d be lying if I said I’m not very anxious already for next week’s episode. As for your blog, I like the look a lot, and hope you expand your Boardwalk reviews as the series goes on.